Wicker Park is located northwest of downtown in the West Town community. The neighborhood is surrounded by the neighborhoods of Bucktown, Ukrainian Village, East Village, Noble Square and Humboldt Park. 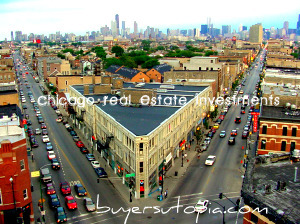 Wicker Park has fast become one of the favorite places to live for Chicago’s young professionals after being known as an artist community for many years. The gentrification has led to one of the hippest neighborhoods in the city with an excellent restaurants scene, hip bars and clubs and fashionable shops and boutiques. Some of the neighborhoods favorite restaurant and bars include; Mac’s, Smoke Daddy, Moonshine, Zakopane’s, Spring, Piece, Mas and Subterranean.